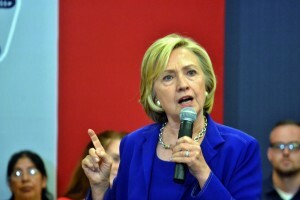 Democratic presidential candidate Hillary Clinton used an Iowa City news conference to address the chatter about a photo showing how her staff using a rope to corral reporters trailing behind Clinton in a 4th of July parade in New Hampshire. Clinton walked up to a throng of reporters gathered in the Iowa City Public Library. “Nick, is that the equivalent of a rope you have up here?” Clinton asked a staff member. She was gesturing to the kind of dividers used in movie theaters and at the airport, to clearly mark where the line forms and how to move to the front. Clinton’s staff removed the dividing line and Clinton started answering questions.